A little snow won't stop this team! Mother Nature made it feel like winter – but couldn’t slow down our spring tournament kick-off! Our 6-8th grade boys traveled to Omaha, escaped the snowstorm and enjoyed games against some great Midwest teams. Today we get to celebrate our stand-out players from the tournament. These Team Brandon Valley 8th graders battled their way to first place in Omaha last weekend. Michael Alpers, 6th grade: Michael had a stand-out tournament showcasing what it means to be a great teammate and player. Coach Jurgens was impressed with how Michael pushed the ball and made crucial plays at the end of the last game. Michael shared that his favorite Brandon Valley athlete is Zach Scholten and when he grows up he wants to be a basketball player. Michael’s favorite subject in school is science and in his spare time he likes to play Fortnite. Josh Olthoff, 6th grade: Josh played with a physical presence in the post and secured numerous rebounds in Omaha. Coach Waltner said that play after play he made smart decisions with the ball by turning and scoring or finding his open teammates. Josh gave it his all throughout the whole tournament which led to a very impressive weekend. Josh’s favorite Brandon Valley athlete his brother, and incoming Brandon Valley senior, Carter Olthoff. Josh’s favorite sports team is the Boston Red Sox. When he grows up he wants to be a professional athlete. TJ Hanson, 8th grade: This weekend TJ was the ultimate leader on the court. He knew where everyone was supposed to be and played Team Brandon basketball the right way. TJ was an anchor on defense with extreme intensity and ball pressure. Coach Scholten said TJ is the glue for the 8th grade team. TJ’s favorite Brandon Valley athlete is Evan Talcott. When he grows up he wants to be a doctor. TJ tells us his favorite thing about basketball is playing hard and doing his best. 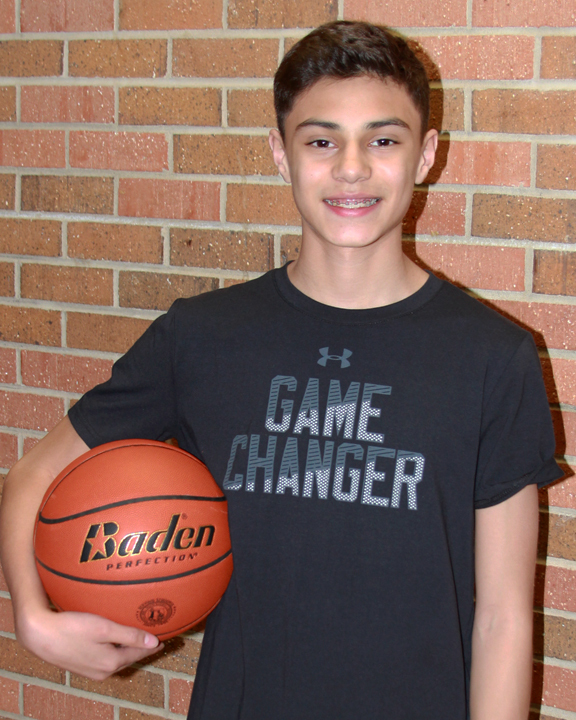 Ryan Doll, 8th grade: This weekend Ryan was consistently guarding the opposing team’s best player while handling the ball for Team Brandon Valley. This allowed him to make game-changing plays on both ends of the floor. Coach Schultz said Ryan demonstrated the work ethic and toughness all Lynx players should strive to achieve. Ryan tells us his favorite Brandon Valley athlete is Jake Adams. His favorite thing about playing basketball is working hard on defense and hitting three-pointers. His favorite basketball memory involves making a key block during last year’s game against Edison.